Let’s see, this day included an eight hour drive, a torrential downpour, lightning, and a rainbow, all sandwiched between breakfast in Barstow and this sunset. Just another day at the office…. Many people spend a tremendous about of time pursuing beautiful images with little or no regard for the half of the scene. They end up with a beautiful scene beneath a bland sky, or a tremendous sky above whatever happens to be in front of them. Combining foreground and sky takes a little bit of preparation, a little bit of good fortune, and a fair degree of sacrifice. But when sky and foreground do come together, your ability to share the beauty starts with appreciating it personally. Don’t get so caught up in photography that you neglect to take a deep breath and take in what you’re witnessing. Now, with the proper sense of awe in place, it’s time to figure out how to do the moment justice. I find that images from the most special moments are those that engender the most skepticism, that generate the looks, comments, and queries that really all ask the same question: “Did you Photoshop that?” Of course the obvious answer is, “Of course I Photoshopped it.” Photoshop is to digital photography as thunder is to lightning. But since the people asking this question have identified themselves as the people most likely not to understand that there hasn’t been an image captured in the history of photography that wasn’t subjected to processing of one form or another (many actually believe that a jpeg is an unprocessed image), acknowledging any processing at all usually just evokes a condescending (albeit ignorant) nod that says, “I knew it.” These skeptics’ real concern is that I’ve somehow deceived them, and to that I can plead emphatically, with a clear conscience, not guilty. We all have our own rules for what is and isn’t an appropriate way to handle an image. And regrettably, there are photographers who have no qualms about deceptive processing. But there are many less justified reasons for skeptical scrutiny of dramatic images. One is that that many people simply forget how vivid color is in nature. 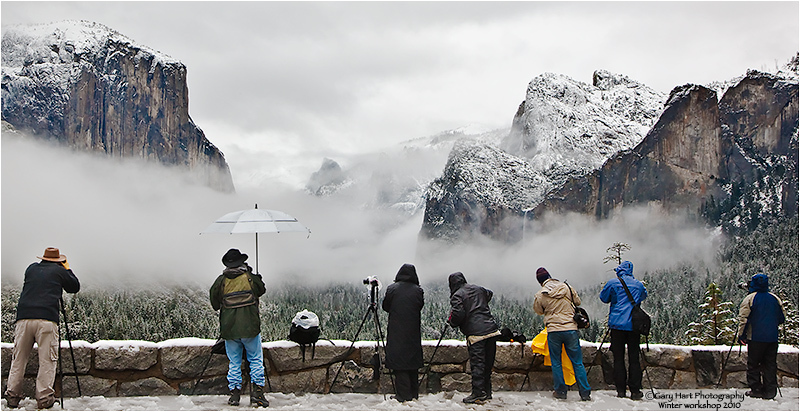 Also, because the best conditions for photography are usually the worst conditions for being outside, relatively few people actually see the world at its most beautiful. And finally, many people (photographers included) hold a photograph to an impossible standard: to reproduce the world exactly as they experience it. Dynamic range, range of focus, motion, a scene’s depth and boundaries are all different to a camera than they are to you and me. Understanding and using these differences is the key to transcendent photography. My personal standard is to remain true to my camera’s reality and to apply my creativity in my camera and not my computer. While I refuse to add things that weren’t present at capture (this doesn’t make me unique), I nevertheless love the control Photoshop gives me, control that I never had in my 25+ years of shooting color transparencies. Much as black and white photographers have done for years, I can now photograph a difficult scene, one that would have been impossible in my film days), in a way that anticipates the processing necessary to reproduce it. And even though I can’t see it in the small jpeg reproduction on my LCD, I know when my raw file contains everything I need to complete my vision, just waiting for Photoshop to finesse it out. 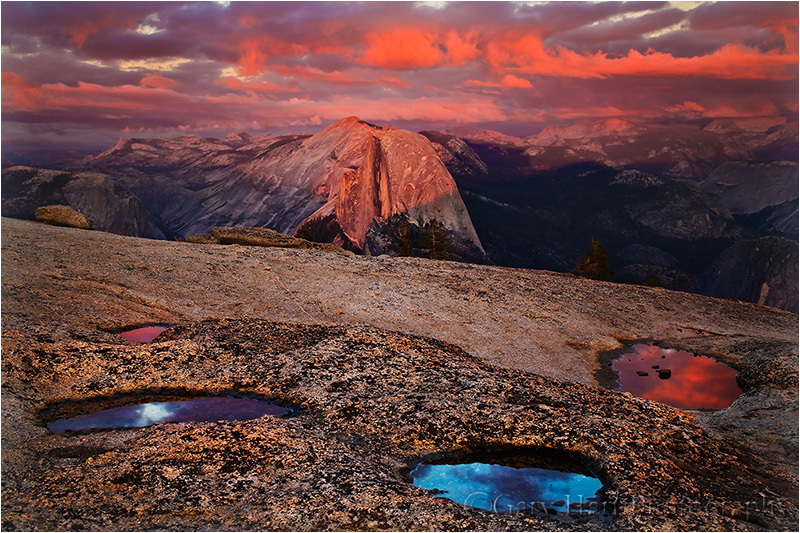 Ansel Adams labeled this capture-to-print approach “visualization”; it was the cornerstone of his success. 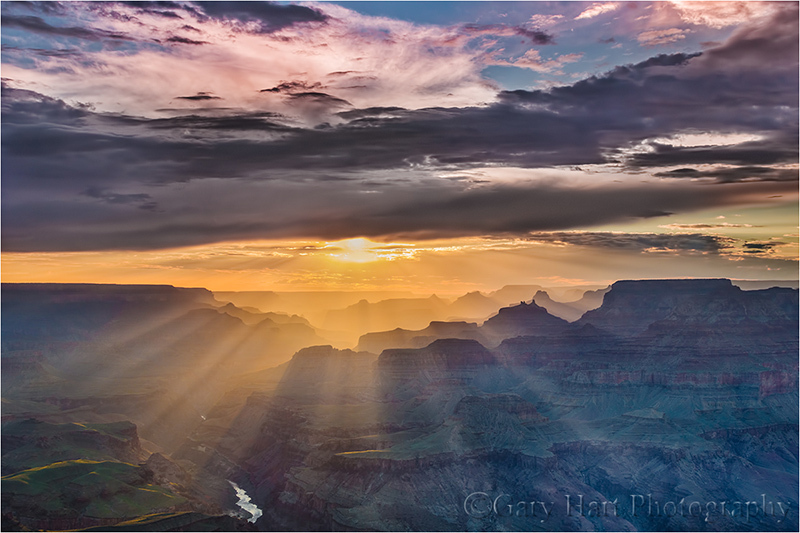 When the setting sun fanned crepuscular rays that bathed the Grand Canyon in golden light, my first thought was that nobody will believe this. Sigh. But my more immediate concern was how to deal with the extreme difference between the brilliant sky and shadowed canyon (dynamic range). I knew that without assistance I’d have to choose between capturing the canyon’s layered detail beneath a white sky, or the sky’s rich color above a black canyon. Since I (stubbornly) refuse to use HDR (high dynamic range blending of multiple images), that left my graduated neutral density filters as the best option for neutralizing the scene’s extreme dynamic range. 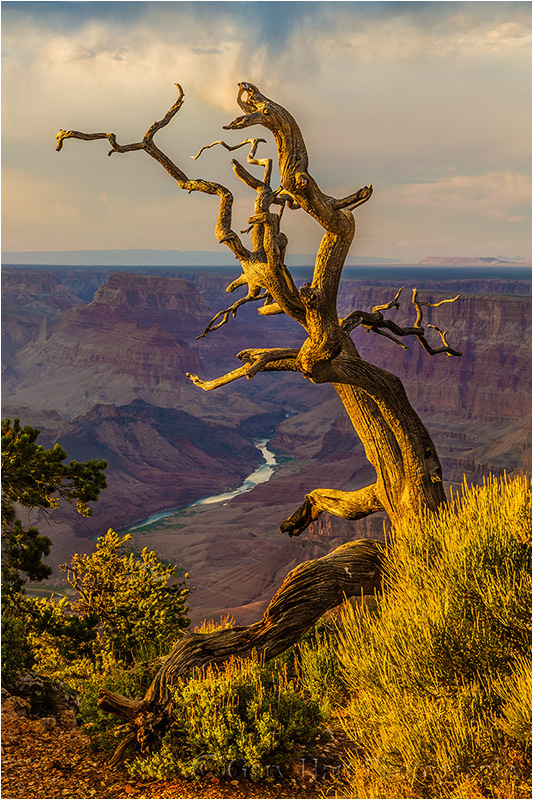 The biggest problem with a GND is hiding the transition between the dark and light halves of the filter, but locations like the Grand Canyon, with its straight horizon lines, are ideal for GNDs. In this case I started with my 3-stop reverse GND and checked the exposure. Not enough. I added a 2-stop hard-transition GND and checked again, confirming that 5 stops of ND did indeed subdue the brilliant sunlight enough to capture its warm color while allowing a foreground exposure that revealed canyon detail. Unfortunately, this recipe rendered the clouds from dark gray to nearly black. Nevertheless, the histogram showed enough shadow detail that I was confident I’d be able to rescue the clouds in processing. The difficult light and use of 5-stops of neutral density required far more processing than typical for me. I started with basic Lightroom processing of the raw file, tweaking the color temperature (warming slightly), adding a light touch of vibrance and clarity, and applying a little noise reduction and the standard lens correction. Then it was on to Photoshop, where I found the processing for the foreground remarkably simple—pretty much adding a little contrast and slightly dodging some of the darker shadows. The sky was a different story, demanding probably 90 percent of this image’s processing. While I was able to bring up the exposure in the clouds, this introduced lots of noise. In general clouds lack fine detail and can stand quite a bit of noise reduction, and that was (fortunately) the case here. Not wanting to touch the canyon half of the frame, I created a layer for the clouds and applied a heavy dose of Topaz Denoise. This left the clouds a little more homogenized that I like, but it’s nothing I can’t live with. With the noise out of the way, I went to work with my dodge/burn brush, working carefully (painstakingly?) to smooth out any evidence of GND use, and also to fine tune the clouds. I referred to the original, unprocessed raw file with the exposure cranked way up (to make the differences more obvious), doing my best to brush in the actual relative lightness/darkness of the numerous cloud layers. Finally I went after the color, which, while not enhanced, was to me was too intense in its unprocessed state to make a credible image. (Sadly, I’m rarely present to defend nature’s color to dubious viewers). So I created several layers to desaturate and lighten the blue sky and gold sunlight. I also removed a slight blue cast from the canyon’s shadows. The finished product is an image that pleases me greatly. While it lacks the depth and dynamic range of being there, it does convey to me the majesty of this moment that ended a memorable day, when the sky opened and heaven poured through. The bolt was so close that I saw its jagged collision in my rearview mirror, its deafening crack shaking the car less than a second later—three hundred yards, max. “Holy crap!” was our simultaneous (eloquent) response. Don Smith and I had just negotiated fifteen minutes of natural pyrotechnics unprecedented in our benign, California-sky lifetimes. Obliterating our windshield, flooding the highway, firing warning shots on both sides of the car, Mother Nature was clearly angry at our trespass. This parting shot came just after the rain had eased from opaque sheets to large, individual pellets and we’d started to relax. To these two Californians, rain is a background phenomenon, faint static on the roof and hissing tires on wet blacktop. Earthquakes, which announce their arrival with a rumble and roll that builds slowly enough to allow quick retreat beneath a desk or door jam, are bland compared to the these random explosions that have done their damage and vanished before your brain can register what just happened. We were in the final miles of a morning’s journey from the Grand Canyon’s popular South Rim to its more isolated North Rim. Safely stashed in the back of the car was the week’s bounty: memory cards, laptops, and backup drives brimming with the Grand Canyon monsoon images we’d come to photograph, including our holy grail, a dozen or so daylight lightning frames apiece. This four-hour detour to the North Rim was a last minute decision with no expectations—whatever we got here would be gravy. A few minutes later we rolled into the North Rim parking area still buzzing with adrenaline. The thunderstorm we’d just survived had given way to blue skies, so we decided to leave the camera gear in the car and explore. While the lightning was gone, the storm’s rumbling vestiges reminded us not to get too comfortable. After a quick peek into the Visitor Center to orient ourselves, we headed down to the Grand Canyon Lodge. The cornerstone feature of the lodge, which is perched precariously on the canyon’s north rim, is a large picture window overlooking an expansive deck with an IMAX view across the canyon to the South Rim, ten miles away. Descending the stairs to the viewing area, we saw people lined up at the window, and stacked two-deep on the deck beyond, all gazing toward the South Rim. It didn’t take long to realize that what had everyone’s attention was a light show dancing across the rim’s entire length. While Don and I had spent the week photographing isolated lightning bolts separated by at least ten minutes, this storm was firing several times per minute. Time to get back to work. In the short time since our arrival more clouds had organized overhead and Don and I found ourselves dodging juicy raindrops as we hustled back to the car. In less than ten minutes we were tiptoeing back out onto the rim, cameras and tripods in hand. Is this safe? Not only was the storm we were trying to photograph no more than eight miles distant, it was clearly advancing. And there seemed to be other strikes landing much closer somewhere behind us. Atop a particularly exposed outcrop (with an awesome view!) just below the lodge, I tried to rationalize away all the lightning admonitions I’d read: “Avoid exposed, elevated areas”; “The next bolt can strike ten miles from its last strike”; “If you hear thunder, you’re too close”; “If you see it, flee it”; “If you hear it, clear it”; and so on. At first we set up our cameras as quickly as possible and rushed to (assumed) relative safety beneath a more sheltered ridge while our lightning triggers did the work. But soon, emboldened by the observation that other (presumably lightning-savvy) gawkers were unfazed by the storm’s proximity, we decided to remain with the cameras. The show lasted about ninety minutes, though the lightning frequency dropped a bit after an hour or so. For variety we’d stay fifteen or twenty minutes at one spot, then move on to a different perspective, eventually making our way all the way out to Bright Angel Point, an elevated knife of limestone sediment protruding a hundred yards or so into the canyon. (In case Bright Angel Point’s elevation and isolation get didn’t get Mother Nature’s attention, the National Park Service has rimmed it with with an iron railing.) And there I stood, as happy as if I had a brain, until the show wrapped up and we went off in search of a sunset location before starting the long drive home. For those keeping score at home, here’s the final tally: Gary 51 (bolts), Lightning 0 (photographers). The thunderheads started blooming at around 11:00 a.m; by noon they were delivering rain and lightning at widely dispersed locations around the rim. 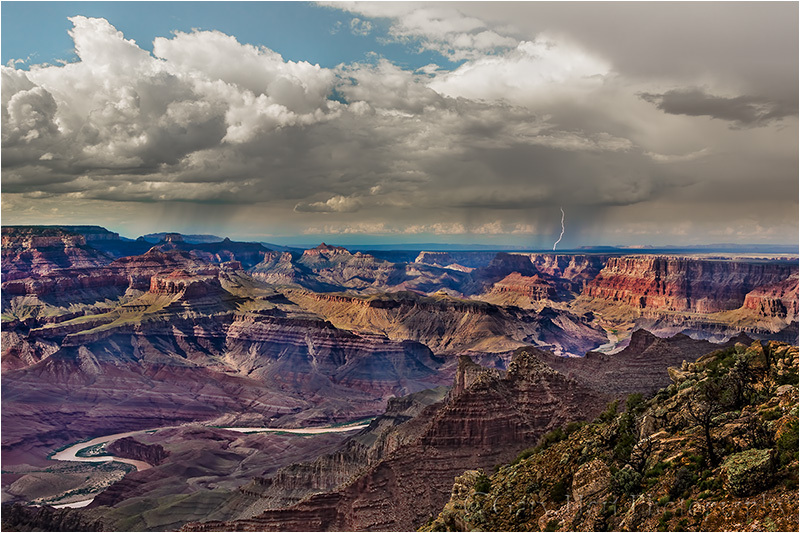 It was Grand Canyon day two, the first full day of last week’s monsoon visit with Don Smith. Seeing black clouds to the east, we drove out to Lipan Point, but after an hour or so of nothing much, decided to shake things up and brave the crowds near Ground Zero for Grand Canyon tourist activity, Mather Point. At Mather, Don and I split immediately—Don headed a little east toward an outcrop away from the crowds; having seen a couple of strikes already, I didn’t feel like exploring and headed to familiar territory right in the teeth of the tourists. Sharing popular vistas with tourists can be trying, but it’s also lots of fun if I remember that my priorities are different from everyone else’s, and that my desire to get a good photograph in no way entitles me to special consideration. Additionally, because carrying a tripod labels me Photographer, I represent not just myself, but the entire community of photographers. In other words, in the minds of others, if I’m a jerk, it’s not just me who’s a jerk, it’s all photographers. If someone walks through (or stands in) my frame, I wait; if someone kicks my tripod, I simply smile and recheck my composition; if someone asks me questions (“Is that a real camera?”; “Are you a photographer?”; “What’s the best camera?”), I answer politely. And I’m always happy to snap pictures of the family, no matter how many cameras they hand me. Because an extended tripod can occupy more space than I’m entitled to, and can be a real safety hazard for people gazing out rather than watching their step, I try to plant myself in as unobtrusive a location as possible. At the Grand Canyon, where everyone lines the rail, this isn’t always easy. In these situations I try to identify the ideal spot, then stand back and wait for the current occupant to move—fortunately, gawkers rarely stay long. Once at the rail, I put one or two tripod legs over or through the rail to minimize my footprint on the traffic side. At the Grand Canyon in particular, where foot traffic seems to flow constantly, I avoid moving around much once I’m set up. This isn’t ideal for someone as concerned about foreground/background relationships as I am, but if I make the right choice to start, I can usually stay happy in one spot for twenty or thirty minutes by simply altering my focal length and orientation. On this afternoon it wasn’t long before I was set up in a spot that made me happy. Having succeeded capturing lightning with a wide composition the prior day, I tried tighter compositions here at Mather. To maximize my odds for success with each composition, I stuck with a composition for two or three bolts (or until it was clear that nothing more was happening in that part of the sky), at least fifteen minutes in most cases. While waiting I’d just stand back, away from the rail, alternating my view between the target rain cell and the steady stream of tourists. With each bolt I’d quickly check the red light on the back of my camera to confirm that the shutter fired. After forty or fifty minutes in a spot, I’d shift to a different location. Being fairly tight with the composition, I know I missed a few strikes just outside my frame. Of the four hits I got that day, the one at the top of this post was the best combination of position in the frame and brightness (I cropped it a little in Photoshop to tighten further). In a perfect world I’d have gotten a bolt striking either Brahma Temple (in the back), or Zoroaster Temple (the shorter tower just in front of Brahma), but I was pretty happy to get this one landing right behind Brahma, about six miles away. In addition to all the quality time absorbing the Grand Canyon’s majesty and the novelty of an electrical storm to my California eyes, I had a blast meeting and talking with people. Lots and lots of people. Between flashes I answered many, many questions: “What are you waiting for?” (“Lightning.”); “What’s that thing on top of your camera?” (“It’s a lightning trigger.”); and, “How does it work?” (“It detects lightning and fires the shutter much faster than I can.”) These questions often led to great conversations with visitors from all over the world, many of whom stood and rooted for lightning right along with me. All in all, a really nice day. The drive from Northern California to the Grand Canyon’s South Rim is about twelve hours. When Don Smith and I scheduled our (first annual) 2012 Grand Canyon Monsoon Mayhem tour, the plan was to leave dark-and-early Monday morning, which experience told us would get us to the canyon just in time to photograph sunset Monday night. But with the National Weather Service forecasting waning monsoon conditions as the week progressed, it looked like Monday afternoon might be the best time to capture our prime goal, lightning. So on Sunday morning we decided to leave that evening, drive as far as we could, then drive the rest of the way Monday. Doing it this way would allow us to arrive by mid-afternoon with a full night’s sleep. Fueled by Starbucks and a steady diet of classic rock, Don and I made it all the way to the acclaimed Route 66 hot-spot, Barstow, California (the gateway to the Mohave Desert). Monday morning we escaped the desert before the heat kicked in, and by 2 p.m. were rolling up to the Grand Canyon South Rim. 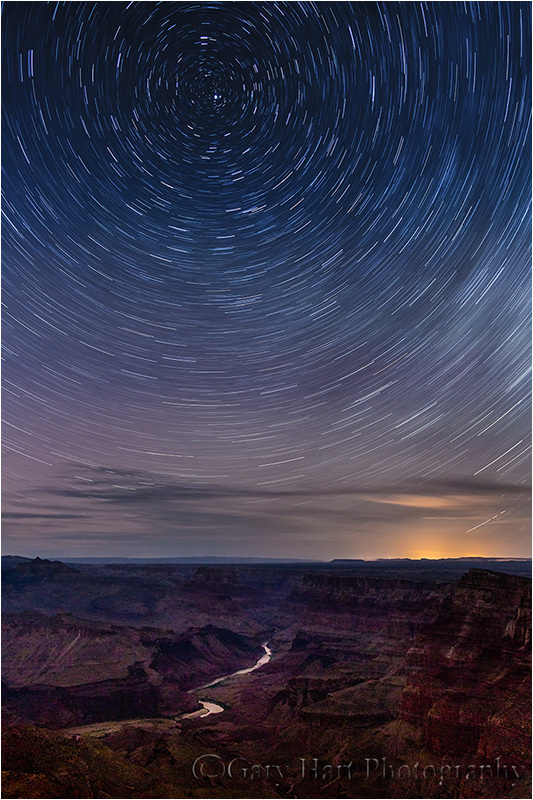 After surveying the skies, we pointed the car east, along the rim, toward Lipan Point, a favorite photo spot about forty minutes away. Somewhere near Grandview we encountered a cell that delivered lightning and sheets of rain, a harbinger of what was in store. Though the Grandview cell was behind us, Lipan Point greeted us with looming black clouds that spit occasional raindrops that sounded like ripe grapes striking the roof, a car-rocking wind, and thunder separated from its flash by mere seconds. Hell hadn’t broken loose yet, but it was sure rattling the cage. We’d counted on a little time to recover from the drive, but there’s nothing like urgency to reveal how unprepared you are. As a Californian (at the sound of thunder, bewildered Californians rush outside), I’d never had an opportunity to use my lightning trigger (an electronic device that detects lightning and fires the shutter in milliseconds); Don had forgotten to pack most of his rain gear. And neither of us had given adequate thought to the impracticality of our plan to avoid electrocution by setting up our expensive tripods and cameras at a popular Grand Canyon vista (in the height of tourist season) while waiting out the danger and discomfort of a thunderstorm in the security of the car. With the storm bearing down on us, what followed was a Keystone Cops swirl of activity—out of driving clothes and into wet-weather gear; extract and attach (and figure out) lightning triggers; find a suitable view comfortably removed from teaming tourists; meter and compose a scene—that culminated in a frantic retreat, sans cameras, when a much-too-close lighting bolt ripped a Niagara-size hole in the sky. As I toweled down my gear back in the car, the wind and rain slowed to a more manageable pace. Unsure of how long our window of lightning opportunity would last, Don and I headed back out, this time in different directions and (somewhat) more prepared. I opted for the best composition that offered the possibility of distant lightning, turning my lens toward a gray curtain of rain a fair distance up the canyon, toward Desert View; Don, who was having technical problems with his lightning trigger, headed a little west and pointed his camera toward a nearby cell that was already flashing behind us. For the next hour or so I heard my shutter respond to a half-dozen or so bolts in the direction of my composition, a good sign, but since the lightning trigger disables the LCD replay, all I could do was cross my fingers for success. When the electrical activity quieted, Don and I reconnected and traded notes. Though he’d resolved his technical issue (I’ll let him elaborate), he was similarly unsure of his success. Lightning or not, we agreed that the sky was far better than anything we see in California. As we chatted, the sun appeared and a vivid double rainbow arced above Desert View—back to work. Lightning trigger off, I was happy to be back more familiar territory—trying to work a rainbow into an already magnificent scene without dodging raindrops or lightning bolts. 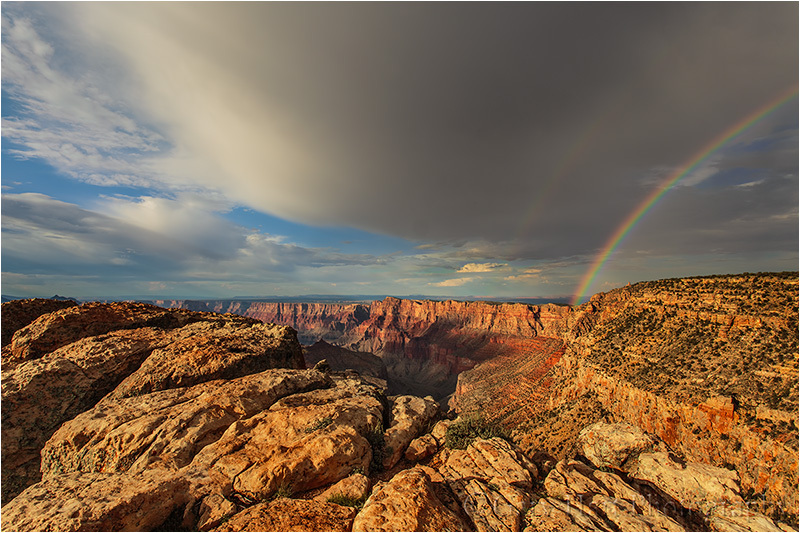 Because the rainbow touched down south of the rim, finding a composition that featured both the canyon and the rainbow required a wide shot that included close foreground elements. I wasn’t crazy about the shrubs and rocks immediately beneath the rock outcrop I was on, so I stood back from the rim a bit and hid them behind the more interesting texture of my grooved and weathered limestone platform. For the rainbow’s thirty-minute duration, I moved along the outcrop, capturing about sixty combinations of foreground and sky, horizontal and vertical, wide and tight. I finished with many, many images that make me happy, but chose this one because (right now) I think it offers the most balanced combination of all that made the scene special: the warm light on the Grand Canyon’s south wall, the rainbow (duh), the rugged character of the limestone supporting me, and the saturated, arcing raincloud responsible for the moment. That great start to our adventure was made even more memorable when Don and I, at the risk of spurring an international incident, selflessly declined the advances of two young German women seeking a bed for the night (seriously). Viewing on my laptop back at the hotel, I was thrilled to find four frames that included lightning. Given all that was in store the rest of the week, my excitement at four frames now seems a little overdone, as was Don’s frustration that his technical problems resulted in a day-one lightning shutout. 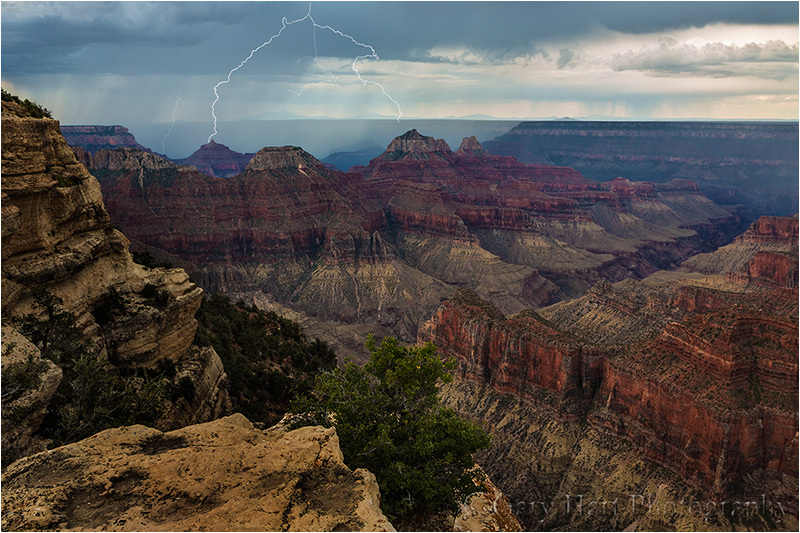 By week’s end we each had more than fifty lightning captures, most coming at the North Rim on an action packed final day that shrunk the beauty of this first day to a distant memory. Stay tuned…. We’ve all heard Dale Carnegie’s trite maxim, “When life gives you lemons, make lemonade.” Of course these pithy statements become popular because they resonate with so many people, photographers included. And it seems that not only are the photographers who adopt this attitude more productive, they’re just plain happier. For example…. Few pursuits are more frustrating than trying to predict Mother Nature’s fickle whims. Last week I was in Northern Arizona co-leading Don Smith’s Northern Arizona workshop. On our first night we pulled in to Desert View to find everything in place for a vivid, colorful, cliché Grand Canyon sunset: billowing cumulus clouds, patches of blue sky, and a gaping hole for the setting sun on the western horizon. The only problem was, for some inexplicable reason, the color never materialized–the sun dropped, the light faded, and we were teased with no more than a few whispers of pink. For anyone who had put all their eggs in the brilliant sunset basket, this would have been a major disappointment. But (in my opinion) what we did get was even better. Anticipating a colorful sunset, I had set up my composition accordingly. I was patiently waiting when, just before reaching the horizon, the sun slipped beneath a cloud and for about 90 seconds painted the canyon’s rim with the brightest, warmest light imaginable. When the light popped I quickly jettisoned my colorful sky composition and scanned the rim for a subject painted by the sunlight. When my eyes fell on this tree I quickly evaluated the scene for the best way to emphasize the tree and foreground light. While the tree and light were front and center, the storm clouds overhead and Colorado River below made excellent background complements I knew I needed to include. I started by aligning myself with the tree’s branches framing the Colorado. Moving as far back as the terrain permitted, I zoomed to fill the frame and compress the foreground/background distance. With a 67mm focal length, depth of field was tricky. My hyperfocal app told me that the hyperfocal distance at f16 was around 30 feet, meaning if I focus 30 feet away, I could be sharp from 15 feet to infinity. I refined my composition, removed my camera from the tripod, focused on a tree about 30 feet away, returned the camera to the tripod, and clicked. I’m a big advocate of surveying a scene, anticipating the light and conditions, and finding compositions before the conditions occur. But the moral here is to not become so locked in to a plan that you fail to seize unexpected opportunities. In hindsight I realize I should have anticipated this light too–I had a clear view of the sun’s path to western horizon, but I was so giddy with excitement about the color that was “sure” to materialize that I almost missed this other opportunity. As it turned out, at Hopi Point the next evening we had the opposite experience–clouds on the western horizon promised to block the color-generating sunlight, but those of us who waited 15 minutes after sunset were (somehow) treated to a neon sunset that had the whole shuttle bus buzzing all the way back to the village (more on this in a future post). Maybe if I were as familiar with the Grand Canyon as I am with Yosemite, I’d be better at predicting its conditions, but until that happens, I’ll just keep guzzling the lemonade.